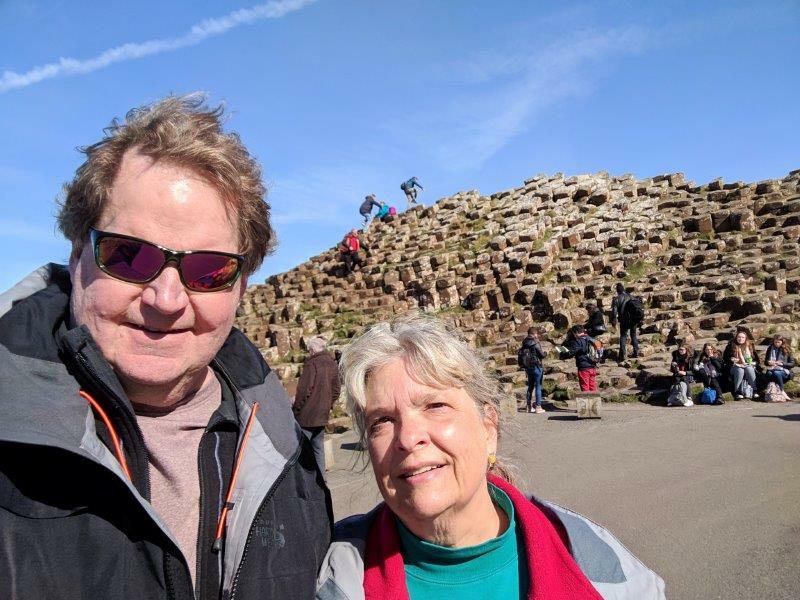 After Julia flew back to Iowa, Mark and I headed north to Belfast, Northern Ireland. It’s certainly not as big as Dublin and not as prosperous but the visit gave us an opportunity to try to understand more about The Troubles over the years. 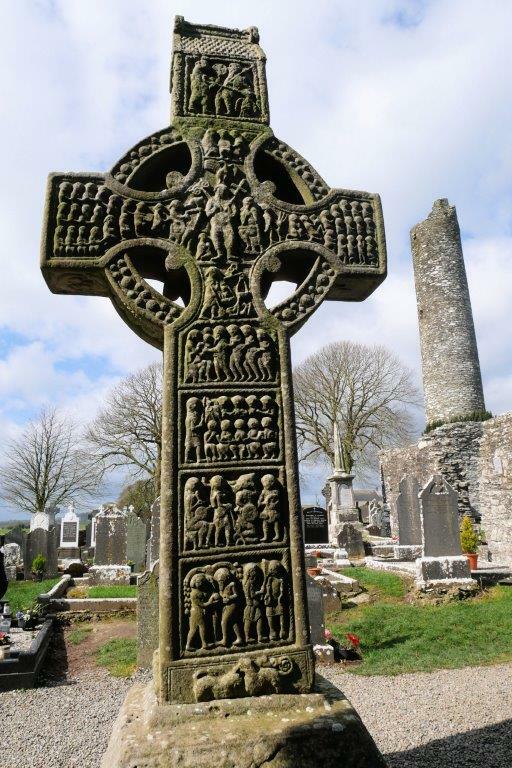 A high cross at Monasterboice. We stopped along the way to Belfast. We took an interesting and educational Black Taxi tour of The Troubles area in Belfast. 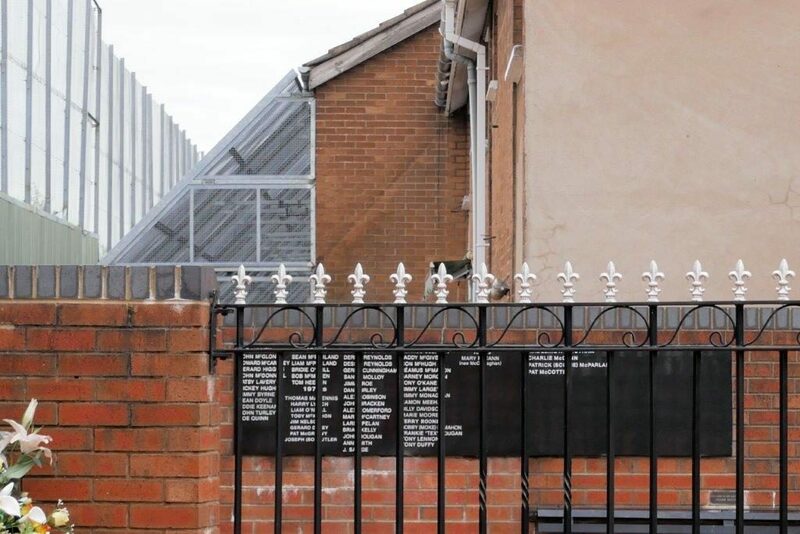 The “wall” – really a 70-foot high fence that’s been made taller since the Good Friday agreement was signed – still exists as well as gates between the Roman Catholic and Protestant areas in the Falls Road area. The gates are closed and locked every night at 11 PM. This memorial is on the Catholic side of the fence. These houses have fencing over their backyards to keep rocks from damaging windows. The fence is now about 70 feet tall to prevent more damaging items from making it over the fence. We’ve been listening carefully to all the Brexit coverage here where the BBC has pretty much non-stop coverage. It’s a new surprise every day! The border between the Republic of Ireland and Northern Ireland is a huge sticking point. Personally, I can’t see any solution to the open border of Good Friday agreement and the closed border of the EU/non-EU country. At the moment, there’s no border – just a sign saying “Welcome to Northern Ireland” on the M1 that’s been covered with red paint! When we left NI, we saw no signs at all. 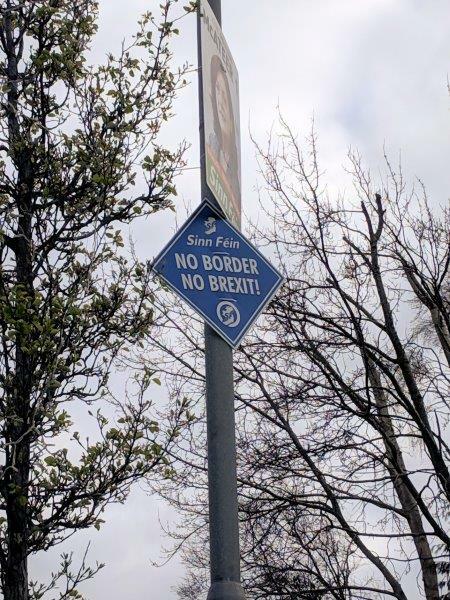 These signs are everywhere in Northern Ireland – at least in Nationalist areas. 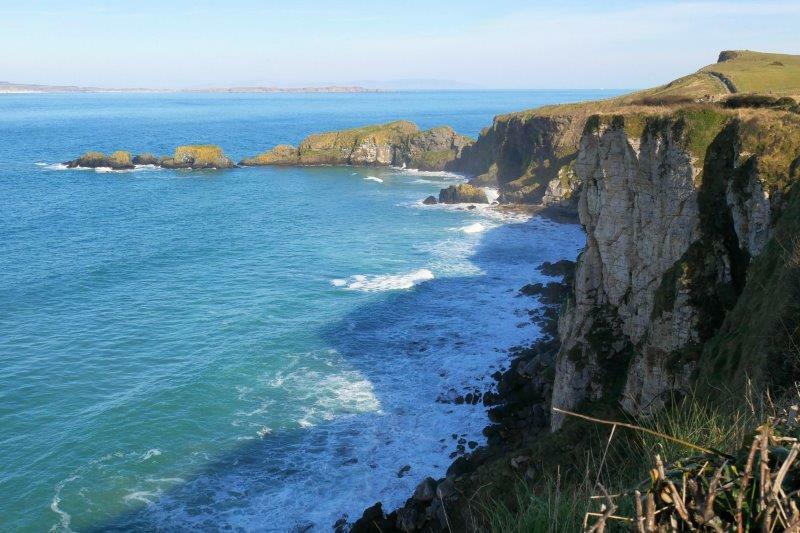 After Belfast, our next stop was Bushmills and Giant’s Causeway way up in the north. We lucked out with the first truly nice day of the trip – blue sky, sunshine, relatively warm. 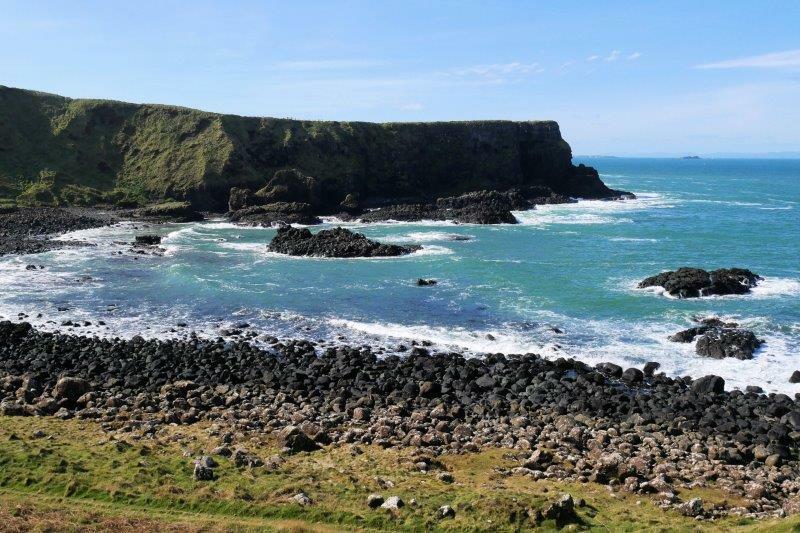 The scenery was spectacular for Giant’s Causeway visit and a drive along the coast. Bushmills is a tiny village with Bushmills Irish Whiskey distillery and not much else. 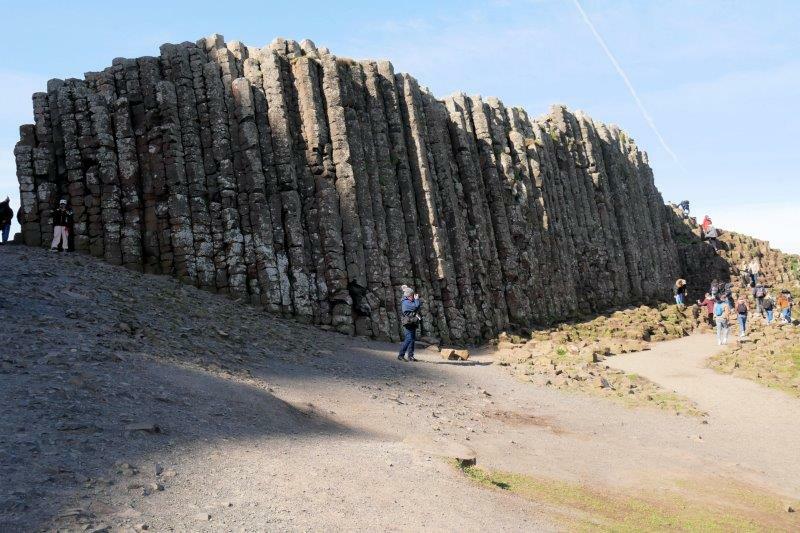 Since the sun was out, we walked 2.5 miles to the Giants Causeway and back. 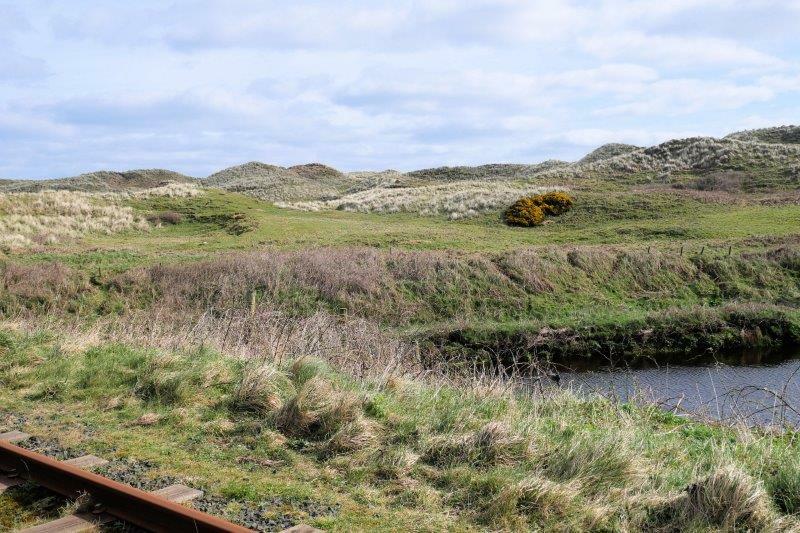 The path followed the tram line and wound through a golf course. Later we drove on the Causeway Scenic Drive. This is a view along that. 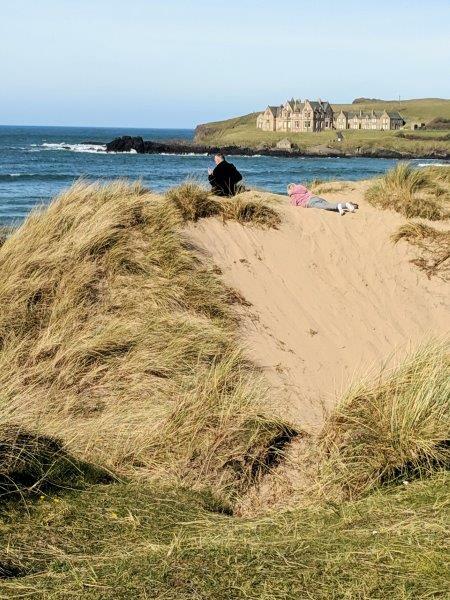 You’d better be good golfer to avoid the roughs. A geologist can explain the details of the rocks that make them wear away into pillars. We’re getting better with the selfies. We didn’t scramble all over the rocks like the group of French high school students did. Sunbathing, Irish Style, when the sun decides to come out! On the drive back down to Dublin, we drove through one town that’s clearly a Unionist town. The curbs and bridges were painted red, white, and blue and the British flag was flying high. If you look carefully, you can see Scotland as a shadow in the very back of the picture. It was clear enough to see the mainland of Scotland! 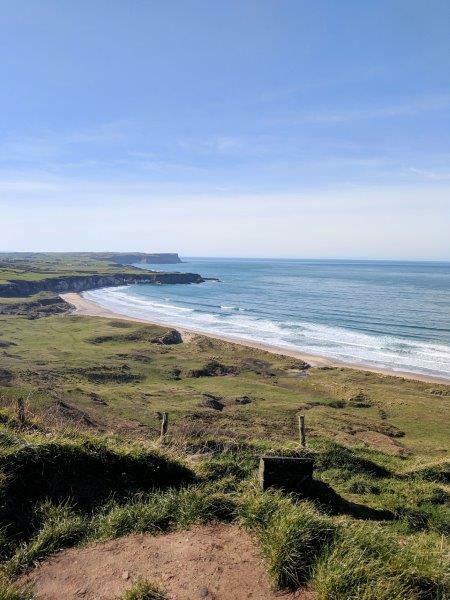 Our last stop before we head off to London is south of Dublin to visit friends David and Celia Drane, their 3 children, 2 dogs, one cat, sheep, horses, cows, and chickens for the weekend. One note about Google maps … I had a paper map with me that we used in conjunction with Google maps. Google maps is great in the cities and towns but needs some human intervention in countries like Ireland where there aren’t many motorways (interstates). When you ask for directions from A to B, it seems to choose the shortest route, without any knowledge of whether those roads are big roads or little roads. In Ireland, a little road can end up being a 1.5 lane road where the speed limit might turn out to be 20 mph due to sheer width of the road! After the first day of this, I started planning out a route on the paper map (making sure I used major roads) and then using Google to take me on that route. Google maps also has a small problem with roundabouts in Northern Ireland. Many of their roundabouts require you to get in the correct lane ahead of time if you don’t want to be forced off at the wrong exit. Google maps can’t tell you to be in the 2nd lane from the left. Their database doesn’t contain the lane markings painted on the road! Google is good at winding you through back streets if you take a wrong turn. It never told us to turn around in town! And it does know the tiny lanes to use to find ruins and churches out in the country.